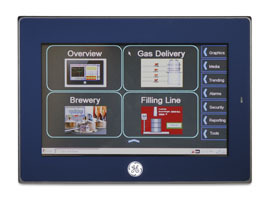 The new GE IP QuickPanel+ Product line is the next generation of GE Intelligent Platform Operator Interface that replaces the older QuickPanel product offering. QuickPanel+ integrates control, view, and an embedded data historian, so the Operator Interface is no longer just a portal, but a strategic bridge for understanding and running your machine. The user now has the ability to use a single device for control, operator interface and communication providing a seam integrated solution and a very affordable cost. The new QuickPanel + is based on Windows 7 Compact providing a secure and reliable operating system that meets today’s IT requirements. Use of feature such as web publishing of screens and remote desktop allow for extreme flexibility and disreputability. For more information see the links below or contact tbehnke@cimtec.com.